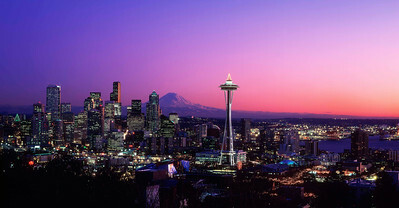 "Solstice" Taken on one of the clearest nights I've ever seen in Seattle, this photo shows Rainier at its winter best. "Blue Sky" Mt. Rainier doesn't get much clearer than this! 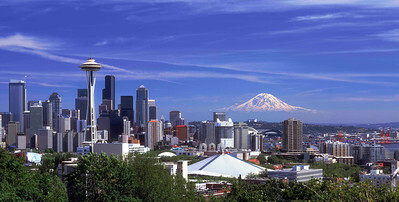 Shot on a pristine spring day from Kerry Park on South Queen Anne Hill. "August Moon" A classic view of Seattle at full moonrise shot on 4"x5" B/W negative film. "Reflections on Lake Union" A 12 minute-long exposure shot on 8"x10" film on a very calm (and cold) February night. Each little sparkle of light that the eye sees in the moment is added to others over time and finally, they coalesce into broad bands of color...much like traffic streaks during a long exposure. The trick is getting the cumulative exposure right and not having any wind or boats to interrupt the reflections. 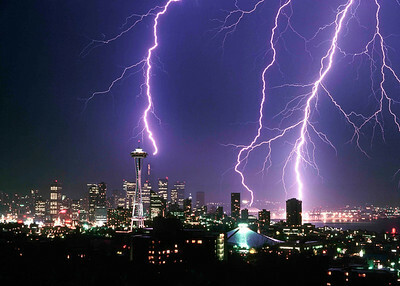 "Lightning Strikes Thrice" A very rare, Great Plains-like lightning storm of historic proportions over Seattle in July of 1984 which did significant damage to many power poles and transformers around town. This shot was one of one hundred taken during the storm and probably at its peak. The bolts are sequential from right to left and show how the cloud recharged itself over time...the first strike on the right is a bruiser, the second rather weak. The heavy bolt on the left actually hit a utility crane which was positioned atop the Columbia Center building and knocked out its wiring. How do I know? The crane operator happened by the Market some time later and told about me about showing up to work and finding his crane "fried". "City of Gold" In the dead of Winter, rainclouds are illuminated by the rising sun and Mt. Rainier teases with a lifted skirt in this HDR image from Queen Anne Hill. "November Moon" A rare clear night on a full-moonrise as viewed from West Seattle looking east to the Cascades, including everything from the Space Needle to the stadiums. "Seattle Spring" Taken from Hamilton Park in West Seattle, this 7 shot pano evokes a glorious Spring day. Look carefully and you'll see the tugboats arrayed along the waterfront preparing for the traditional Maritime Week race. "Aurora" Taken from mid-span of the Aurora Bridge just north of Seattle, this sweeping view shows Lake Union on a beautiful spring day and everything from Gasworks Park on the left to downtown and East Queen Anne Hill on the right. "City of Light" A 9 shot stitched panoramic taken from the 4th floor attic window of a 100 year old house on the very top of Queen Anne Hill looking south. Shot on the 25 megapixel Nikon D3X, the resolution of this photo is amazing. 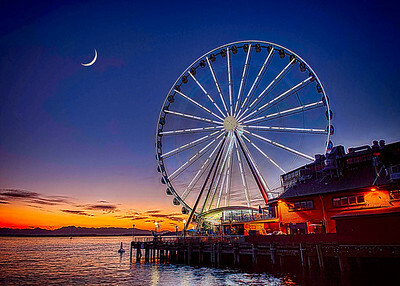 "Beacon Hill" A fabulous sunset in late April 2013...note the new ferris wheel (the "Eye of Seattle") on the waterfront and the Mariners game being played at Safeco Field. "Summer Solstice" A rare summer combination of a beautiful sunset reflected in the windows and a very clear Mt. 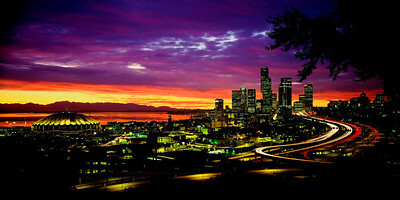 Rainier created this Queen Anne panoramic in late August of 2014. 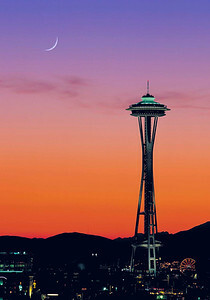 "Needle 12" Seahawk colors of blue and green light up the Space Needle and the 12th Man flag flies proudly during a winter sunset.